So many butterflies! How wonderful that scene must be. It would be hard for me to go inside and leave it. The Zebras are delightful! Amazing. So beautiful. I want to really work on my butterfly garden this fall. absolutely amazing. i have never seen so many butterflies in a single place. Do you prune your buddleia very much? And do you keep it deadheaded? Mine just quits blooming if I don’t deadhead religiously, which I often don’t. Also, is yours in full sun or does it have a little bit of shade? No, I don’t prune this buddleia at all. It’s just too huge. There is a smaller one near the house (I have several) that I think I will try pruning next year to see if it performs better. But this one just keep growing and pushing out the flowers. I cut it way, way back each spring. Because of its size, it’s a process that now requires a full-sized saw. But that’s the best way to treat it. Is that a single lens reflex you used in that click? Wow. You are butterfly rich. I am wondering if they like the white bb best. My daughter has one and it is also covered with butterflies. My pink has them here and there. The video is a nice treat. What amazing shots. You’ve managed to capture the very essence and beauty of my favourite insect. It’s so sad that these lovely creatures have such a short life span. 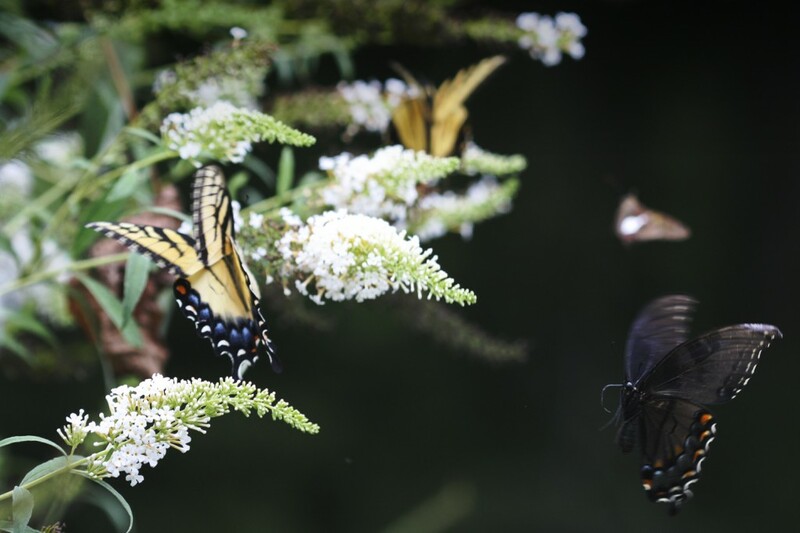 Thanks for sharing the abundance of all those beautiful butterflies! Butterfly bushes are quite lovely. Marginally hardy where I garden though. Apparently in some areas of southern USA they are now considered a nuisance plant and they encourage people not to grow them. Too much of a good thing I guess.